What it is: A year or two ago I fell in love with using craft knives on my crafting projects. It started because I needed to precision cut large patterns from bold patterned paper to create paper embellishments for scrapbooking pages and cards, but soon I was using it for many more tasks - like trimming chipboard, precision-cutting traced circles and freehand cutting swoops and flourishes. However, there were a few problems with the craft knife options out on the market. I purchased a few different styles to find one that I really liked...but I never did. The craft knives I was using were uncomfortable (mostly made of metal), and if my kids got into my scrapbooking supplies, they posed a real hazard. I recently started using the Bo Bunny Retractable Craft Knife (hereafter abbreviated as the BBCK) and I am hooked. It is quite simply the best craft knife I have used and in the following article I'll tell you why. - Comfort. At last year's CHA I tried out Fiskars new take on the craft knife. It was supposed to be ergonomically correct and therefore more comfortable. It was not. It was so awkward in my hand, and made applying pressure impossible. In a nutshell...I hated that thing. And traditional, standard craft knives were made of metal and really hurt after extended use in one sitting. I find the Bo Bunny craft knife to be much more comfortable and easy to grip. - Precision. The BBCK has a very small and very thin blade. It cuts with more precision than any other craft knife I have used, and this is so important if you are cutting very fine or ornate detail. - Safety. I lose everything. And that means that within 1 day of buying my old, traditional metal craft knife, I had lost the small plastic lid that covers the blade when not in use. I found my kids reaching for it more than once. The BBCK works like a standard pen and exposes the blade with just a click and retracts easily as well. If my toddlers really wanted to, of course, they could still get into it and do some serious bodily harm, but at least that bodily harm is now a click away instead of an exposed open blade. - Cute. C'mon...you know I had to address it. It's all cute and pink! And although it wouldn't be a deal-breaker if this thing was black, it sure is nice to have a cute little knife in my stash. You can also purchase a matching self-healing mat, but I found it to be too narrow for my taste since it measures 6"x13". If it came in a 13"x13" square I would be all over it, since it has no-slip backing and a ruled grid. - Economical. Of course, I know there are cheaper craft knives out there, but if we compare the aforementioned Fiskars knife (which retails for $10.00) to this, which, for two dollars more, provides you with 5....yes FIVE extra blades. And that saves me a trip to the Super Walmart to search for replacement blades at 2 AM. Priceless. - Might be a larger initial investment than some want to make for a craft knife. - It should not be used for too heavy duty a job. Trying to cut through 3 or more layers of heavy cardstock may break the plastic blade encasing. But it is wonderful for more delicate jobs. 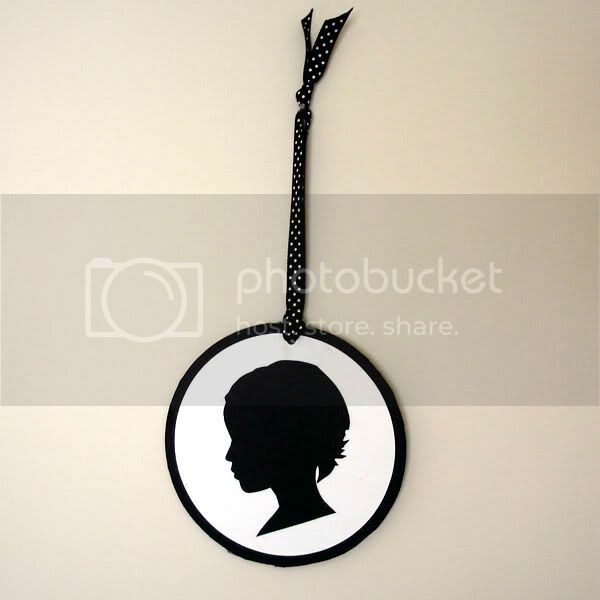 For full instructions on making a silhouette of your child, like the one above, check back tomorrow. Comes with: 1 retractable craft knife and 5 replacement blades. What do YOU think? I am truly a lover of this product. But I want to know what you think. Too expensive for a craft knife? Do you like the Fiskars knife better? Do you love it as much as I do? Please share your thoughts! I have the Fiskars fingertip craft knife and find it useful and helpful for as much as I use a craft knife which isnt much. I know that they have came out with one that rotates now for easier control and movement. What a great review! I need a good one of these. I will have to put it on the list of wants! Love what you made! I'm not a big knife-cutter and have a couple of options in my stash. So, not really shopping for a new one right now. I don't use a craft knife a lot, but as with any tool, I want it to a) work properly, b) work efficiently, and c) be made to last awhile. Sounds like this BoBunny Retractable Craft Knife fits the bill. A tool is no good if it doesn't get the job done, even if it's free - I would gladly pay a little more for a tool that actually works and works well. I'm curious ... I have the EK Success one, which looks very similar to the one you show here. It's retractable, the blades screw in and out pretty easy. I wonder how it compares to this one. Anybody tried both? Thank you for the review. If I'm in need of a craft knife in the future, this seems like one I'd be interested in. I would be happy to pay a little extra for a good one. I have the non swivel Fiskars knife and really like it. The safety issue isn't a big one for me, but if I had little kids into my stuff, I would agree this would be the way to go. love the silhouette! thanks for the 411...this will be my next scrappy purchase as my craft knife should have been buried with the dinosaurs! LOL! I love the Fiskars knife, it fits my long, skinny fingers (thank you, Mom!) to a T! The other craft knives that are held like a pen just don't work for me. I'm just not made that way...I've got horrible handwriting too! Heh! CUTE project. I do want to try out that craft knife. I have the Fiskars finger one, and I like it, but I crave a more precise blade. Thanks for the review, and the recipe. I've been looking for something better than the old school metal ones! I think I'll have to try this one out...........and besides, it's PINK!